Result : Comilla Victorians won by 7 runs. Player of the Match : Thisara Perera (Comilla Victorians). 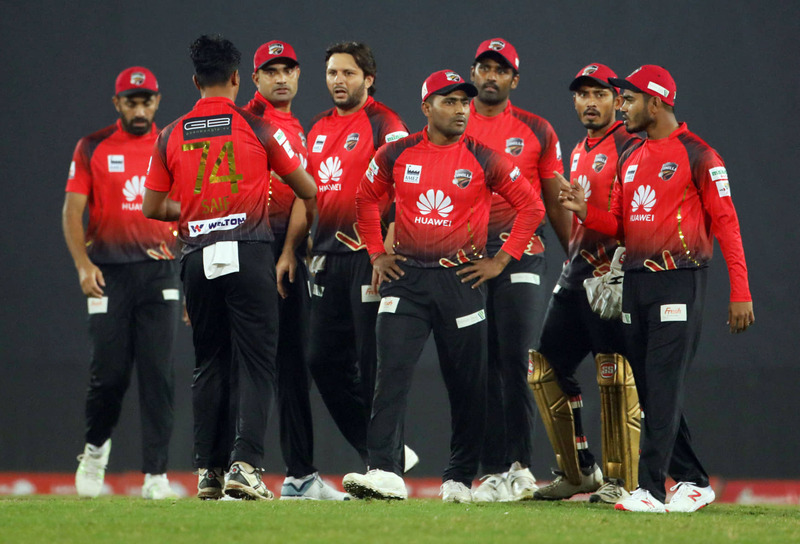 The spirited Comilla Victorians have clawed their way back as they register 3rd consecutive wins to keep their playoff hopes alive, defeating the table-toppers Dhaka Dynamites by 7 runs. Despite the win, Comilla remained at the third spot on the points table with 10 points while Dhaka still hold the top spot with same points for better net run-rate. Earlier Shakib Al Hasan opted to bowl first after winning the toss. Victorians were managed to post 153 for 8 in 20 overs thanks to Shamrus Rahman’s 48 and Tamim Iqbal’s 34. Shakib claimed 3 wickets for 24. Dynamites did not have the ideal start as they lost 4 wickets for 50 in the ninth over. But Shakib and Andre Russell’s 62-run stand revived the Dynamites innings as they looked set for a easy win. Following the vital wicket of Russell on 46, Victorians bowlers then bounced back by picking up couple of wickets in regular intervals as Dynamites were ended on 146 for 7 in 20 overs. Player of the match, Thisara Perera grabbed 3 wickets for 14.